Gift of Jonathan J.G. Alexander, 2004. Ms. illuminated for Ferdinand of Aragon (1452-1516) and his wife Isabella of Castile (1451-1504), whose coat of arms, posed on an eagle, is still partly to be seen on the illuminated border. Ms. presented by them to the Dominican convent of Santo Tomás in Avila (Old Castille); the complete manuscript was probably owned and cut up by Manuel Rico y Sinobas; this miniature was sold by C.G. Boerner in 1912 (cat. 110, 28 Nov. 1912, lot 56); it belonged later to Prince Liechtenstein (not mentioned in H. Bohatta, "Die Fürstlich Liechtentein'sche Fideikommissbibliothek in Wien: Geschichte, Übersiedlung, Kataloge", Zentralblatt für Bibliothekswesen, 32, 1915, p. 185-196; and was acquired by H.P. 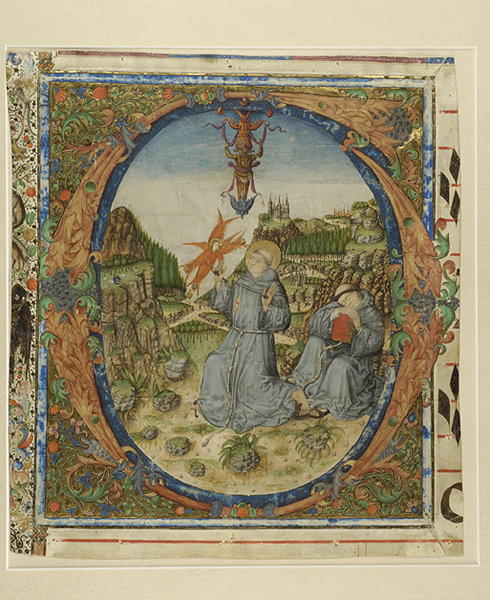 Kraus, who described it in the notice of another miniature from the same manuscript (H.P. Kraus, catalogue no 112, lot 45); Sam Fogg; Jonathan J.G. Alexander (bought 1990); Gift of Jonathan J.G. Alexander, 2004. Ms. single leaf (cutting) from a gradual; written and illuminated in Spain (Castile), perhaps Avila, 1482-1492. Text: Initial "G" for Gaudeamus omnes in domino diem festum celebrantes sub honore beati Francisci (introit for the Mass of St. Francis on on Oct. 4). Verso (former recto): fragment of the communion for a Mass of the Blessed Virgin, likely for the Nativity (Sept. 8): "[Beata viscera Mariae virginis quae por] --taverunt | [aete]rni patris - [fili]um alle-- [luia]". Decoration: 1 historiated initial G (355 x 315 mm), in pink and green foliage, on gold background with vegetal decoration (fruits). Margin decorated with inhabited foliate and floreate ornament and coat of arms. Artist: Workshop of Juan de Carrión. 15 other leaves are known (see detailed description).